I’ve Got a Ticket To Ride! Some of us will ride the 18 mile route (with the option to jump to 27 miles if so inspired.) Some of us will ride the 45 mile route. Some of us are riding this event for the first time. For some, this is their first organized ride ever. There will be plenty of hard-core cyclists at the Tour, but we aren’t them. I’ve met everyone on my team, and ridden with most of them, but there will be plenty of introductions made Saturday morning, since most of them will be be new to one another. We aren’t a close-knit friend or family or corporate team, although there will be plenty of those riding Saturday morning as well. We aren’t world-class advocates or philanthropists. What we are is a group of everyday people drawn together by the promise of a well-organized and supported event and the hope that we can do a little something about a big problem. We aren’t heroes, except for the fact that by saying yes to a pretty minimal bit of time and effort, we have collectively raised over $2,000 dollars so far for research, education and patient advocacy, more than twice our goal and 100% more than we would have done if we’d said, “Maybe next year.” Two men on our team are “Red Riders” which means they’ll be wearing spiffy red jerseys to indicate they ride with diabetes while the rest of us (like almost everyone else in this country) have friends or family members with either the Type 1 or Type 2 diagnosis. We all want to make a difference; committing ourselves to the effort brings us one step closer to actually doing that. Share with us one of the ways you give your time, money or sweat to make a difference! 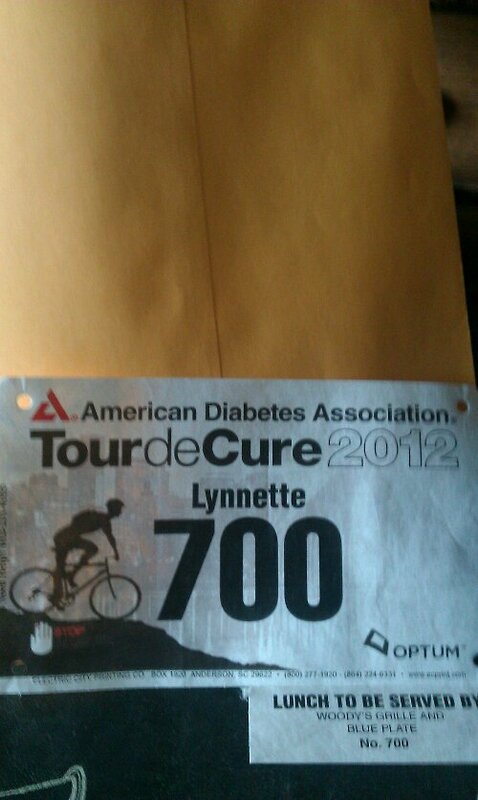 This entry was posted in Cycling, Good Behavior, Tour de Cure and tagged Cycling, diabetes, make a difference on May 31, 2012 by lynnettedobberpuhl. 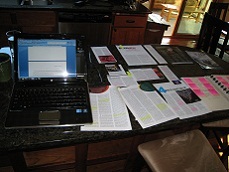 Writing is like cooking. It looks so easy and fun when somebody else is doing it, but is a total freaking mess and full of traps when I go at it on my own. Reading a book primes my literary pump the same way watching a cooking show gets me thinking “chef’s hat,” inspiring all kinds of confidence and energy because I see the beautifully produced final product, not the labor, the re-writes or the re-takes (when the plot twist or souffle implodes.) By the time I start bleeding, because knives and other sharp utensils really aren’t my thing, or by the time I am painfully knotted in a narrative thread, it is too late to completely turn back. Sure, I could toss the mess in the garbage, clean off the countertops and call for pizza. I could close without saving and pull out a new book to read. But the ghost of the unfinished dish or story will haunt me, prodding me to try again. “Come back! !” it will wail in a ghostly voice, and, my friends, I need no more voices in my head telling me to do anything. It is noisy and crowded in there as it is. When I see it through to the end, even if I don’t particularly care for the result (and my assorted Philistines have nothing favorable to say,) I can still feel some satisfaction, or at least humorous resignation toward the experience. Maybe it wasn’t a success, but it was progress. Writing, cooking, academic performance, or even living: it is harder than it looks. Obstacles arise. Natural ability only takes you so far and the rest is work and perseverance. Sigh. Now if you’ll excuse me, I have a mess in my kitchen I need to attend to. This entry was posted in Persistence, Uncategorized, writing and tagged cooking shows, kitchen, mess, writing on May 29, 2012 by lynnettedobberpuhl. I grew up in eastern South Dakota. 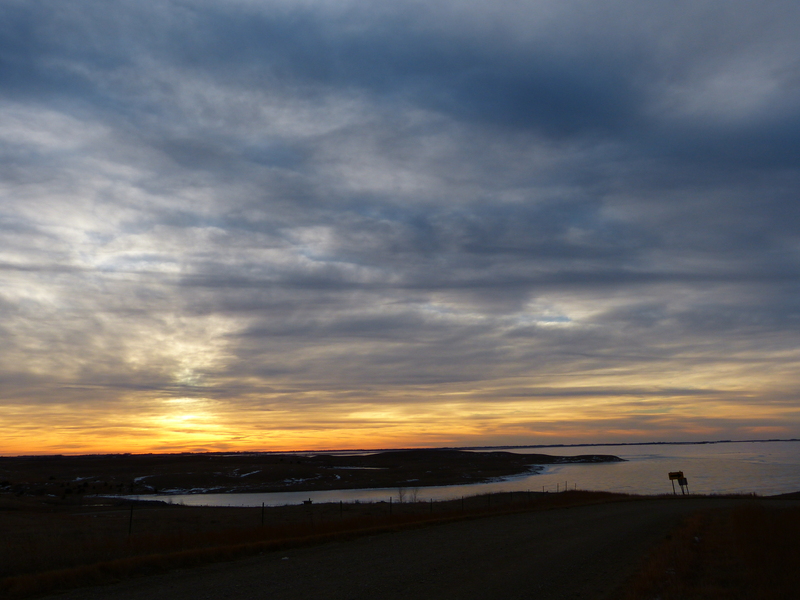 Two of the things I have always loved about that place are the vast skies and the way the tall grass on the open prairie ripples like waves on a lake, tossed by the nearly incessant wind. Squint a little and you can see the past, into a time before the towns, the highways, the wire and post fences and the yellow squares of lamplight signalling home existed. When there are no houses or buildings around to distract you from your smallness, you get a sense of proportion that is a gentle reminder of our true size in this incomprehensibly enormous universe. One can get a unique kind of clarity experiencing the wide open. When I was young, I couldn’t wait to get away from the home where it seemed like there was nothing but earth and sky and judgment. I rushed off to experience noise and activity and possibility. Now, saturated with noise and activity, and grieving the crushing death of many of those possibilities, I fantasize about building myself a little cabin off the grid on a small rise in the middle of as much empty as I can find. I long for a place in the openness between earth and sky, where I might quietly wait to see what possibilities clarity can bring. 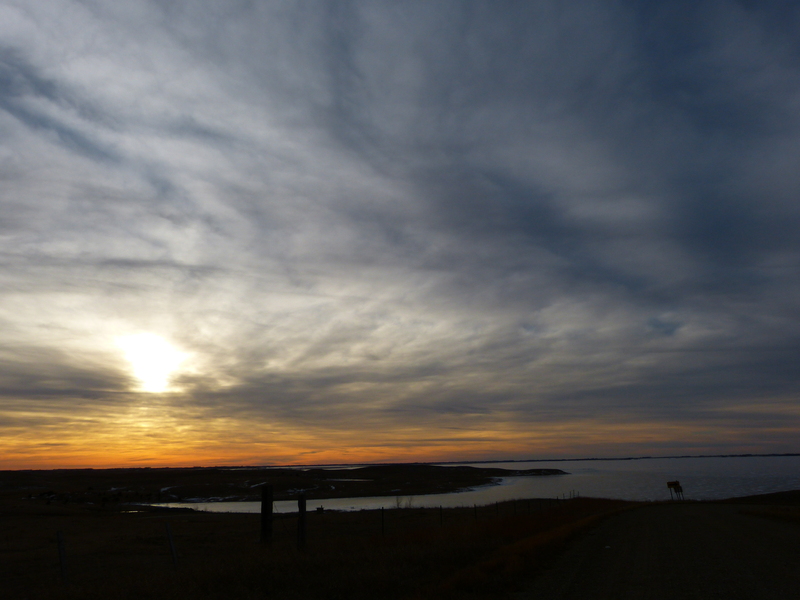 This entry was posted in When Time Stops and tagged clarity, open skies, photography, prairie, South Dakota on May 24, 2012 by lynnettedobberpuhl. One of the best things about my new job (the one with the lowly title of Administrative Assistant, but which I think of as Problem Solver, and some days as Problem Solver Deluxe,) is that I get to DO things, quite fun things, that I would never likely do otherwise. Hobnobbing with the chefs and local news celebrities on the Kitchen Stage was one, and more recently I attended Rocket Club’s CD release concert/party for their second album North Country at the Varsity Theater which was awesome, all of it, and on a Thursday night to boot. 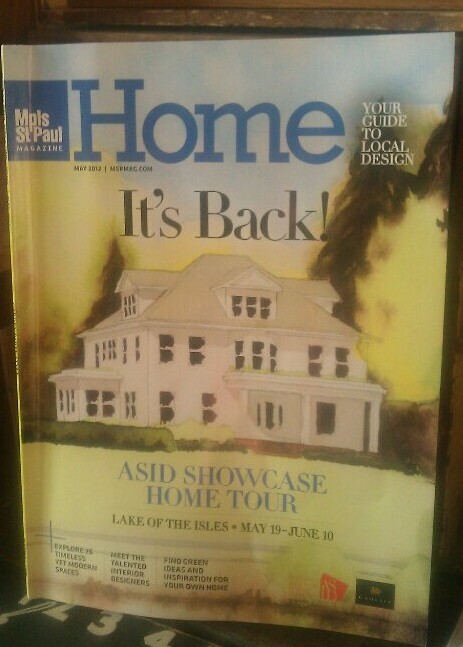 Last night I got to go to Mpls St. Paul Magazine’s 40th Birthday Bash at the Showcase Home for the ASID (American Society of Interior Design) Home Tour. Here is a picture of the house, as painted by one of the owners, John Larsen, for the cover of the special issue. Being an easy jog away from Hennepin Ave. the location isn’t quite as bucolic as pictured, but the home is across the street from Kenwood Park and a stone’s throw away from the Lake of the Isles, at least according to the map. I didn’t see the lake, but there were a lot of distractions. Like the check-in tent where we had to present our tickets for admission, and this woman dressed in a paper gown made of pages and covers from Mpls St. Paul Magazine. The festivities were held outside. It was a gorgeous night so the canopies over the yard were largely unnecessary. The party was well supplied, with Barefoot wine and Summit beer and Two Gingers whiskey livening up the drinks area, delicious sushi rolled on-site, and trayfuls of appetizers (the habanero poppers gave me hiccups) circulating. 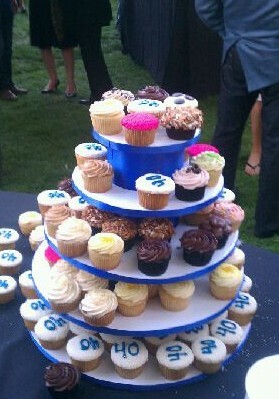 Heaps of tantalizing cupcakes decorated a table. The DJ supplied dance music from 70’s and 80’s and while there wasn’t any dancing going on while I was there, there were plenty of colorful people, including some local celebs familiar from television and the Kitchen Stage (Rena Sarigianopoulos, Elizabeth Vries, Todd Walker, Amelia Santaniello, Stephanie March, and Bill McCoy were a few I saw) and some of my friends from work all laughing and talking. But the star of the party was the house. The 100+ year old house was redecorated by over thirty designers who divvied up the 20+ rooms and, in cooperation with the owners John and Mike, managed to create an eclectic look with a harmonious flow, balancing function, sophistication and playfulness. The charm of the older home remained in the original woodwork, but was complemented by new wallpaper and drapes that were both luxurious and modern. 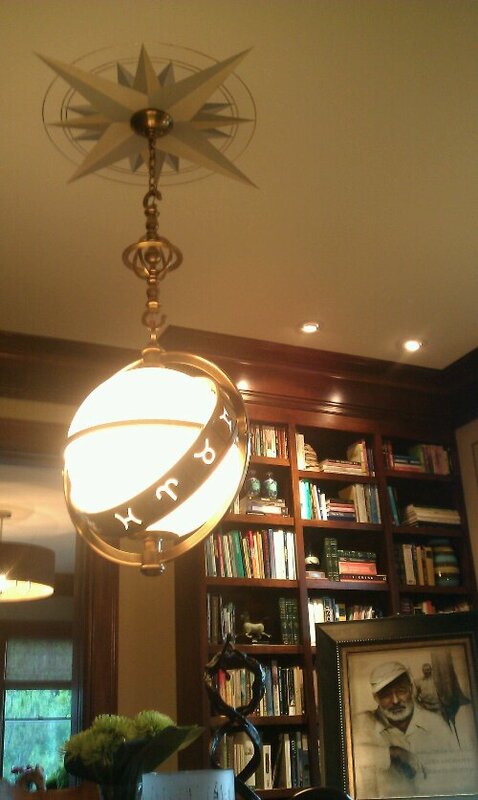 And as always, I was fascinated by the light fixtures.I am also coveting the library. And the rugs. And the entire kitchen (so many cupboards, and discreet outlets every 12 inches?) 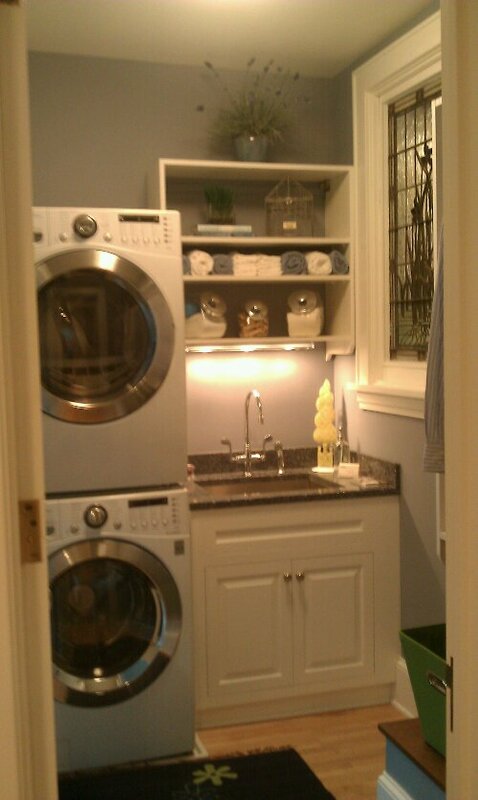 And the cutest little laundry closet I’ve ever seen. Yes, that is a stained and leaded glass window and a Cambria countertop on a sink that is anything but utility. Mr. Wordtabulous and I had a long haul back to the ‘burbs, and children to catch lingering over Xbox instead of cleaning up the dinner dishes and getting ready for bed, so we made an early exit. As we do. 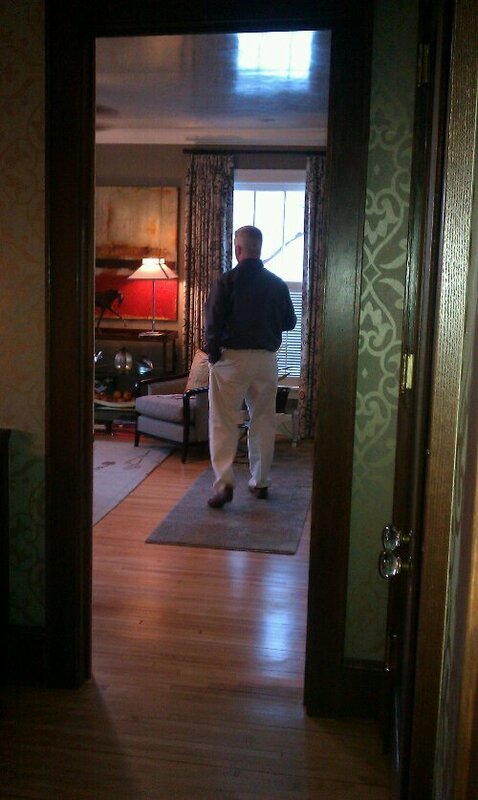 I’d like to thank the homeowners, the designers, the magazine and my employers for another eye-opening experience and a few ideas (we have a plan for a window seat now, and Mr. W is not opposed to big print drapes, who knew?) Lastly, thank YOU, dear reader, for riding along! 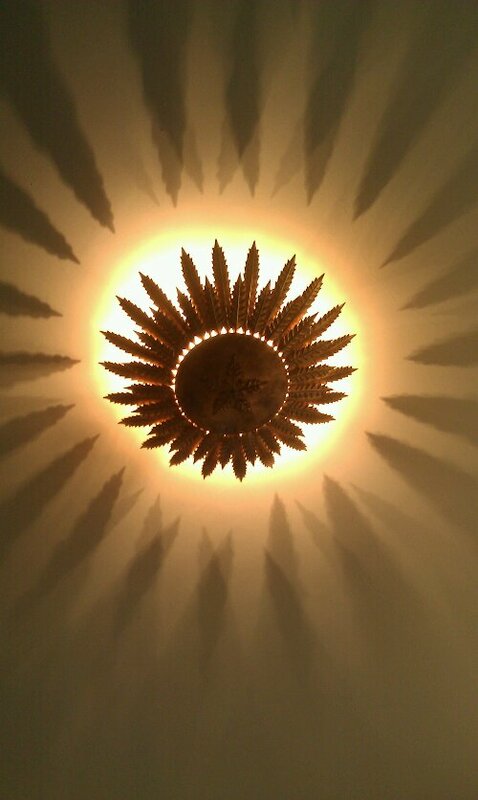 This entry was posted in Humor, Popular Culture and tagged ASID, home decorating, Home Tour, Mpls. 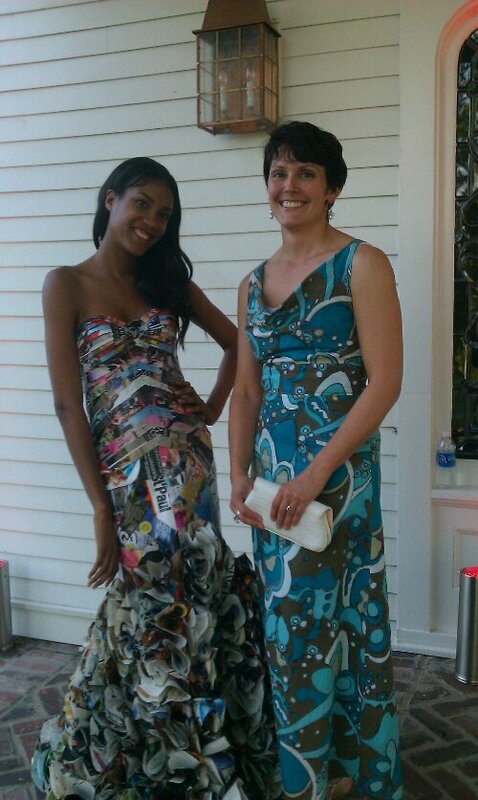 St. Paul Magazine, party on May 22, 2012 by lynnettedobberpuhl. Spring is skipping happily toward summer, and I have finally gotten my bike out on the road. Both my bikes, actually. There was a rough patch in my life, following the birth of my second child and lasting for several years, during which I felt I was losing large parts of my identity as an individual. I loved my family, and loved my job (until I didn’t, when I stopped,) but I felt a little lost in the mix. I needed something fun that was just mine, and I remembered loving the wind on my face as I coasted down hills as a child. I bought a Raleigh bike with medium nubby tires, a cushy saddle and a straight handlebar. Something happened as I mounted the bike and pedaled off with no destination in mind. My focus on meeting others’ needs evaporated, with no one needy around. My preoccupation with concerns and to-do lists lifted. I could feel my blood coursing through my veins, practically singing, and I felt like I had come home. I met Linda, a lovely woman from church, and we started to ride together. She had a road bike, built for higher speeds on paved roads and coaxed me into longer distances. She was the one who persuaded me to sign up for my first-ever organized ride: The Ironman Bicycle Classic in Lakeville, MN, so named because it offers distances of up to 100 miles in the early spring before anyone here is fully ready for long distances and because sometimes participants ride in snow, not because of any relationship with the Ironman Triathlon. Linda and I rode the 62 mile course in 1999, and I was hooked. She moved away, but I found an outdoor cycling group through the local fitness center. I bought a road bike, a Univega Modo Vincere. I eventually began organizing the group and teaching indoor cycling classes. I rode in recreational and fundraising events (including a few centuries, or 100 mile rides,) and even competed in a few events. Then I turned, or re-turned to writing, and while I have never lost my love for cycling, it has become less and less a part of my life. Now I ride one fundraising event a year, the Tour de Cure for the American Diabetes Association, and a handful of rides with others or by myself each season. And this is the thing: getting back in the saddle is still like coming home. When I am in a bad mood or mentally blocked, pedaling 10, 15 or 20 miles in the fresh air blows off the cobwebs, bringing me clarity and inspiration. Nowadays I ride a Specialized Allez Comp, but I still get that Raleigh out once in awhile. Chasing speed and distance is a thing of my past, but I hope I never fail to find myself, when I am feeling a little lost, out there on the open road. How or where do YOU find yourself, when you have felt the grind of life eroding away who you are? This entry was posted in Cycling, Health, Parenting, Tour de Cure, Uncategorized and tagged bikes, Raleigh, Specialized, Univega on May 16, 2012 by lynnettedobberpuhl. To Err is Human, to Post is Feline. Cynical: Would you ever write a cat blog? DITH: What do you mean, like a single post, or a whole, like, themed blog? Cynical: Don’t play coy with me. Would you ever start a blog strictly around cat images, cat care, and cat love? Just to get the hits? DITH: Let me think. I do really love my cat. If I did start such a blog, it wouldn’t be just for the hits. DITH: Stop it. I don’t think I have enough material. Cynical: That isn’t an answer. And seriously? About a fourth of your posts have something to do with a cat anyway. You aren’t far off from being a cat blog. As for material, what did you just buy? DITH: A leash. For my cat. Cynical: And if we looked in your photo gallery on your phone, what would we find? DITH: Cat photos…lots of them. But he’s very photogenic! And everyone else I take pictures of look like they’re in pain! Cynical: So you have the material, you have the obsessive interest, and you have the attention-seeking personality that would dangle tags like “cat,” “cute,” “funny,” and “playful,” with the objective of luring people in just to raise your stats. Why don’t you start taking pictures of your cat next to photos of movie stars, or of him watching trailers of new release movies so you can work those into your tags, too? DITH: I don’t like your tone. And I don’t think people who write cat blogs are only interested in hits, they are sharing the joy of cats. Cynical: Now you are just pandering to the cat bloggers. DITH: Wow, you’re mean. Look, the answer is no. I wouldn’t write a cat blog just for the hits. Also, I don’t have the attention span for a single topic and I lack commitment. That is why my blog is the whack-a-doodle mishmash that it is. I write what I want to (yes, yes, PREPOSITION.) Besides, if I were really cynical, I’d write about Walk Off the Earth T-shirts and local news anchors because according to my stats THAT is where the action is. 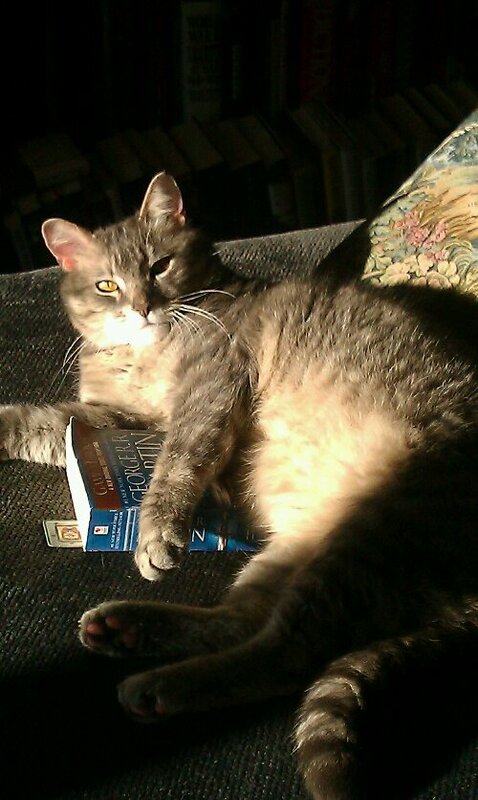 That being said, here is a funny picture of my cat sitting on top of the novel A Game of Thrones by George R. R. Martin. If only he was wearing my WOTE t-shirt and sitting on Leah McLean’s (from KSTP) lap. This entry was posted in Blogging, Books, Cat, Humor, Parenting, Popular Culture, Uncategorized and tagged A Game of Thrones, blogging, cat blogs, cats, funny, George R. R. Martin, stats on May 9, 2012 by lynnettedobberpuhl.